"Steven R. Petrin, Westbrook College, Class of 1977"
Westbrook College student Steven R. Petrin, Class of 1977, was a Nursing major and lived in Goddard Hall. 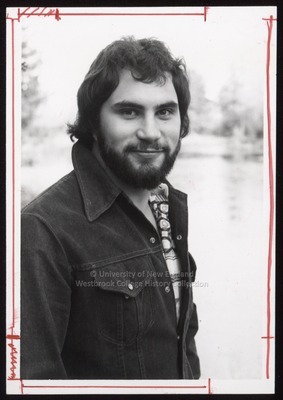 For his senior class candid photo, which appeared in the 1977 Tower Yearbook, Steve wore a colorful shirt and a dark suede, jean jacket. His hair was curly and longish, and he sported a beard and mustache. Steve's photo background is blurred and unrecognizable.